In 1930, in a book titled “The Zoo,” poet Ogden Nash wrote about a large, flightless bird: "The ostrich roams the great Sahara. Its mouth is wide, its neck is narra. It has such long and lofty legs, I'm glad it sits to lay its eggs." Nash didn’t pen a tribute to the emu, the ostrich's flightless cousin. Had he, the poem might have noted the similarities and differences of these Ratite family members. In terms of largest birds, the ostrich holds first place, the emu, second. The emu comes from Australia and the ostrich from Africa. Five species of ostrich exist. The common ostrich (Struthio camelus) has the largest eyes of any land animal at 2 inches across. The ostrich can stand 4 to 9 feet tall and can weigh 140 to 320 pounds. They are long-lived, with life spans of 40 to 50 years. The birds are omnivorous. The ostrich has two toes and a claw. The male is black and white in color; the female gray-brown. There is one species of emu, Dromaius novaehollandiae. 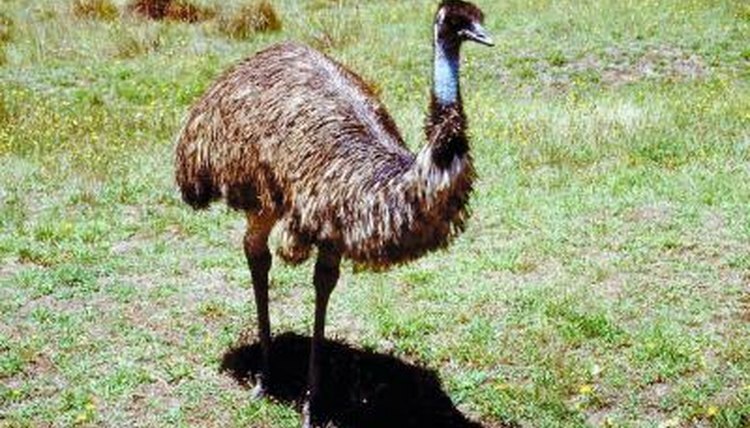 The emu is shorter than its ostrich cousin, reaching anywhere from 5 to 6 feet tall. Emus also weigh less; they can range in size from 40 to 132 pounds. An emu has three toes. Emus live only about 10 to 20 years. Emu chicks hatch with stripes. They turn chocolate brown and, in 12 to 14 months, both male and female emus have indigo-colored feathers. Emus and ostriches are polygamous in different ways. Female emus mate with a male, lay eggs, and then leave that male, who incubates and cares for offspring. The female then mates with another male. Male ostriches fight to create a harem of five to seven females. Eggs are laid in communal nests. Emu and ostrich chicks are precocial, meaning they hatch with down feathers and open eyes, and leave the nest in a matter of days. Ostriches and emus are speedy creatures. An emu can run 25 mph and sprint at 30 mph. Ostriches can run up to 42 miles per hour. Ostrich races, with riders on the birds' backs, are still popular. Both birds lay large eggs; the ostrich lays the largest of any bird. Ostrich eggs are white, nearly 6 inches long and weigh almost 3 pounds. Emus lay greenish-blue eggs weighing about a pound. National Geographic: Oldest Globe of New World Carved on Ostrich Eggs?